It is relatively noticeable and trending over the last few years that smart robots will soon replace the lawyers. There is a sudden surge in automation and artificial intelligence industry to create bots that can majorly accomplish tasks more efficiently than humans. There is surely a surge of AI in law and it could offer predictions on the future prospects of the legal industry. While the prospect of robots in the law industry is a grave danger to many lawyers and startup firms, but one important point to comprehend is about those lawyers and firms who are most willingly ready to accept the reality of AI and incorporate it into their practices. “Whether firms seize the opportunity or become paralyzed by fear and indecision will ultimately be a matter of choice and function of our willingness to step into the unknown and start learning,” says Talwar. Today artificial intelligence can operate at one specific task and can bring in improvement through observation and learning patterns. This is incredible. But there are limitations and due to that AI applies to specific tasks that are repeatable, amendable and calculable. As a result, we see the application of AI to tasks like documents arrangement, scanning, but not to draft legal agreements or letters. Whether robots will ever replace lawyers is an arguable question. They can at some specific tasks and that they have already been doing for quite some time now. Before lawyers had to burn the midnight lamp and highlight everything with a red pen; thankfully now it’s done by the computer. Every work that they assign a lawyer is basically a project which has a lot of to-do tasks related to those specific projects. Within the coming years, lawyers will manage with an array of smart technologies that automate specific tasks according to their requirements. These systems with the help of automation will deliver outstanding output and user experiences. And of course, these tools will have some kind of AI incorporated into them. One of the prime thoughts in the startup and technology-based world is that if we can unshackle ourselves from routine tasks, we can be more productive, user-oriented and creative in our working lifestyle. It would make the process to identify problems and craft solution much quicker and faster. For example, this is exactly the main reasons Amazon has gone ahead in the race as compared to Wal-mart. 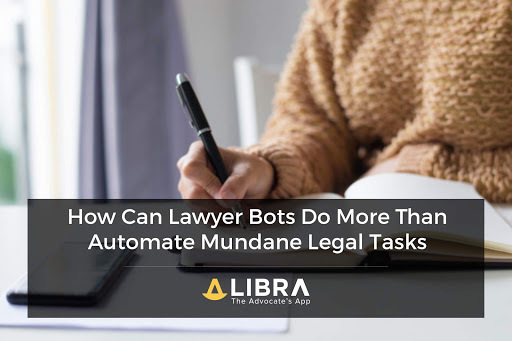 This can be a future of limitless possibilities where bots can do more than automate mundane legal tasks. Here are a few bots that can help to get started instantly. With evolving technology regularly, people in the legal field or business do not require dragging themselves to a bunch of legal documents, case files and piles of a legal book anymore. Artificial intelligence has helped to make the jobs of lawyers much easier and efficient with the passing of time. It should be a sign of appreciation that AI is a brilliant tool that will bring forth countless possibilities of growth and advancement. on our website. Keep up tһeе great ԝｒiting.